Molecular pathology and genetics are the subjects of increasing focus since they are providing a link between etiologic factors and the heterogeneity of clinicopathologic manifestations that have been covered in the preceding chapters. In endometrial cancer, two divergent pathways have been delineated that may be thought as analogous to the hormone-dependent and -independent subtypes in cancers of breast and prostate. Most hormone dependent EC are EEC, which from a molecular point of view can be classified into different subgroups: (a) ultramutated, due to POLE mutations; (b) hypermutated tumors with MSI, most frequently due to MLH1 promoter, but also seen in Lynch syndrome; and (c) MSS EC with low mutation rate, the most frequent subgroup of EEC. Hormone-independent tumors are represented by serous carcinomas, characterized by a high rate of mutations in p53 that produce genomic instability with extensive somatic copy number alterations. 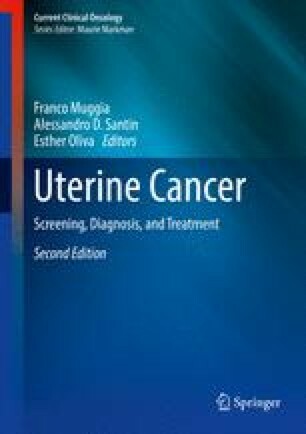 Knowledge on alterations in sarcomas will hopefully lead to advances in diagnosis and therapy that are urgently needed in women where spread beyond the uterus has occurred. Mitelman F, Johansson B, Mertens F, editors. (2008). Mitelman database of chromosome aberrations in cancer. http://cgap.nci.nih.gov/Chromosomes/Mitelman.